Many individuals interested in changing their current employment situation are noticing that the current health care situation in our country seems to indicate a large-scale demand for more workers in the coming years. Those same individuals may be wondering how they can best prepare themselves to take advantage of this in-demand field. The Master of Public Health degree is a great option to consider. It enables current people with public health or management experience a way to leverage their experiences in a way that fits well with the healthcare administration field. The following sections contain many different sources of information that will make it possible to get a thorough understanding of what is out there, and some of the ways to become more familiar with the environment. Berkeley (UC Berkeley Online) – Master of Public Health with Health Policy and Management (HPM) concentration – The HPM concentration is one of five focus options available to UC Berkeley MPH students. The HPM course sequence builds on the MPH core to give you the strategic management, health policy development, and healthcare finance skills you need to be an effective leader in any healthcare organization. University of Illinois at Chicago – Master of Public Health in Health Policy and Administration – The ability to complete this course online is a major benefit for those potential students looking for a flexible program to fit into their life. Many options exist for tailoring this curriculum to particular interests, and applies to those at all levels of public health administration. Loyola University Chicago – Master of Public Health in Public Health Policy and Health Management – Primary to the studies in this program are an emphasis on the many disparities that exist in both racial and economic factors as well as bioethics. Availability of an online course of study make this program appealing to people no matter where their location. The core courses in the MPH degree will all be represented with classes required for the degree. These will consist of epidemiology, health policy and management, environmental health, biostatistics, and social and behavioral aspects of public health. For the specialization area of Health Policy and Management, the particular required courses will vary between colleges and universities. An example of courses that are part of this specialization would be from the University of Arizona, whose program is mentioned above. While programs will vary on the specifics, these represent what will be found in most graduate programs of study. These core competencies are the ideas and thoughts around which these programs and curriculums are designed. 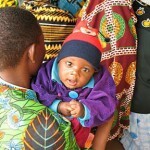 The core of the program is the MPH so each of the five areas of knowledge will be addressed. 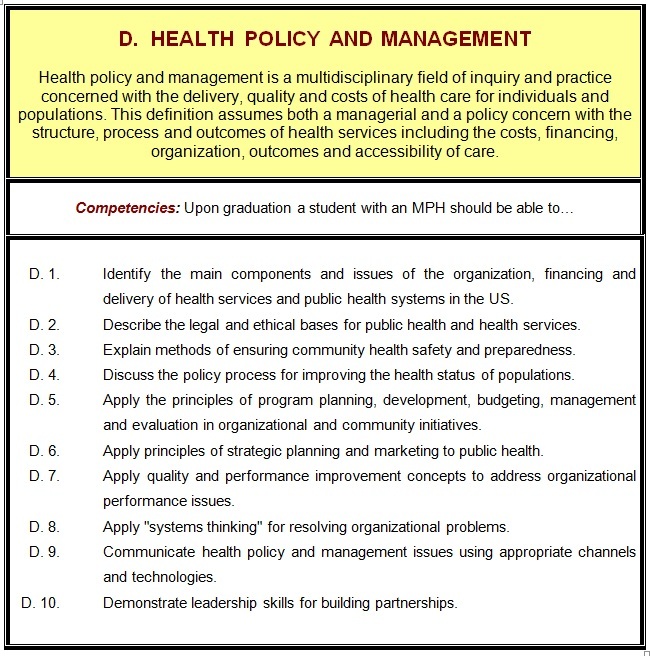 For the students selecting to concentrate in the area of Health Policy and Management within the MPH degree, they will then go on to be educated more thoroughly in this one of the five main areas within MPH. Sommer Scholars Program – Johns Hopkins University awards this scholarship to public health heroes of the future. MPH students from U.S. and abroad are all eligible. Includes full tuition and a living stipend. HRSA Training Grant – Health Resources and Services Administration provides this grant for those incoming students interested in working in certain fields that are determined to have shortages in the near future. Corris Boyd Scholars Program – Seeks to provide support to deserving students of color in graduate programs of healthcare management. Each scholarship carries a value of $40,000 for accepted programs. David A. Winston Health Policy Scholarship – Looking to provide financial assistance to those students interested in working in healthcare administration at the state or federal level after graduation. Applicants must demonstrate financial need to be considered. ACMPE Scholarship Fund – Supports and promotes future leaders of the future with established records of experience and potential to contribute to the healthcare management profession. Students must be enrolled in a relevant degree program to be considered for this award. American College of Healthcare Executives Diversity Internship – This three month internship provides opportunity to see how the operations of ACHE work, and to get first hand experience in each of the divisions. Includes some chances to attend meetings and conferences related to the study they are completing. Elliott C. Roberts Scholarship – Provides financial assistance in the form of a scholarship to eligible students from ethnically diverse cultural backgrounds. Available to first and second year graduate students studying healthcare administration. They must demonstrate financial need and have maintain a GPA of at least 3.0. Professor Emeritus Thomas B. Fitzpatrick Scholarship – This scholarship is provided at the University of Pittsburgh and consists of full tuition support for outstanding MPH students. These scholarships are given based on a special financial personal need, and must be present to be considered. U.S. Public Health Service Scholarship – They offer three programs to assist students financially during their studies, and require commitment of work in exchange. This work can occur during the summer break or as an intern with the U.S. Public Health Service Commissioned Corps. Bruce A. and Amelia R. Goodrow Endowment – Designed to support East Tennessee State University students who are pursuing leadership positions to shape public health in their futures. They show preference to military veterans, and to applicants from Tennessee. The International Journal of Health Planning and Management – For those interested in being part of a forum for publications that bring to light varying topics that deal with current issues in public health. The ability to maintain a balance between theory and practice can be approached by constantly rethinking of theory in terms of real world dilemmas and challenges. Journal of Public Health Management and Practice – This bi-monthly peer-reviewed journal provides information on practice and research that address the many areas of public health management. Topics include emergency preparedness, bioterrorism, chronic disease prevention, as well as linkages between theory and practice. Health Management, Policy and Innovation – Published through the effort of Northwestern University, this journal is sponsored by the Business School Alliance for Health Management. These online journals are published online on a monthly basis. They promote the work of academicians and give this platform for them to circulate their ideas and research to improve management of the various sectors of the public health system. Population Health Management – Comprehensive, authoritative strategies for improving the way that health services are delivered to entire populations is what makes up the mission for this journal. When essential research is completed and presented, it is made part of this journal so that the implications can be taken and put to work in individual health management situations wherever the person happens to be located. Information Technology in the Health Care System of the Future – Course offers unique perspective on the progress of information technology on modern health care systems. They highlight the various economies of scale, technical efficiencies, patient educational opportunities, and other things, that make future discoveries seem very exciting. Seminar on Health Care Systems Innovation – Studying the many different technologies at play in the health care system, this course provides the opportunity for students to see how evolving systems and processes will contribute to a more efficient and productive system if utilized appropriately. Cross-Cultural Leadership – This seminar course provides opportunities to develop personal leadership skills in environments where more than one cultural identity exists. Weekly readings work to help students identify various differences in cultures, then to work forward with an understanding of how that may affect the way that decisions are made. Water and Sanitation Infrastructure in Developing Countries – With many areas of the field of health policy and management dealing with underserved communities throughout the world, this course may be beneficial to some. Course provides instruction on necessary elements for designing safe and simple systems for water supply in these areas. Ethical Issues in Public Health – Focusing on resource allocation, summary measures of health, right to health care and how they apply to modern ethical issues related to public health. Provides lecture materials and readings in order to facilitate necessary information being acquired. History of Public Health – For a proper framework to learn about modern public health, there is a great value in learning about how our health care system got to what it is today. A more thorough understanding of the history of public health can assist current managers and administrators by having examples of past situations. The study will address thematic structures within health care systems, and use that as a basis for comparing of structures that existed across the globe at different points in time. Population Change and Public Health – The way that different countries handle their population policies will be compared and contrasted. There are many examples of how these affect the demographic process and how the management of the health policy can have a drastic impact on the way that populations increase or decrease. Using Summary Measures of Population Health to Improve Health Systems – The measure and definition of how diseases impact populations is taught during this course. The proper use of these tools can improve the way that resource allocation addresses the individuals most needing those limited funds. 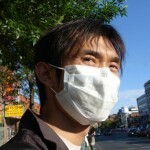 Impact of Pandemic Influenza on Public Health – This course provides specific training in monitoring the path that the avian influenza took, and tries to use this example to represent ways to control these diseases in the future to minimize global health detriment. Case Studies in Primary Health Care – Using cases from developing and developed countries, students examine the ways that community health care works. This provides students the opportunity to see real situations come up, and to practice potential solutions to see results.